Outside of Latin America, the United States is the world¡¦s leading consumer of the American mahogany (Swietenia spp.) harvested in Latin America, and imports an estimated US$56 million of American mahogany annually. Big-leafed mahogany (Swietenia macrophylla)¡Xalso known as genuine mahogany, caoba, mara (in Bolivia), or mogno (in Brazil)¡X is the most traded and coveted of the three American mahogany species. Conservationists are concerned that current harvest rates and practices may be pushing big-leafed mahogany in the same direction as Caribbean mahogany (Swietenia mahagoni), which was once heavily traded but is now endangered and commercially exhausted because of past over-harvest. Big-leafed mahogany matters not only to U.S. consumers with expensive taste in furniture, but also to mahogany-producing areas (range states) where the resource is critical to local economies yet increasingly threatened by intensive and illegal harvest that is driven, in part, by U.S. demand. For these reasons, the United States has a powerful economic incentive to conserve big-leafed mahogany so that the species continues to serve its ecological function as well as yield a resource upon which local industries and individuals depend. Moreover, felling mahogany trees for overseas markets may affect more than just the species. Roads specifically created for removing valuable timber species like mahogany increase the susceptibility of forests to migrating farmers who convert the forest to farmland, thereby exacerbating habitat alteration and loss of biological diversity. TRAFFIC North America, with funding from World Wildlife Fund-US (WWF-US), reviewed the U.S. mahogany market to put into perspective for U.S. consumers the significant role of the United States in the mahogany trade. This report is intended to inform American stakeholders of the scope and scale of U.S. demand for big-leafed mahogany, the conservation implications of such demand, and various options for promoting and improving the species¡¦ conservation. The Caribbean and, more recently, Central and South America have been supplying mahogany to international markets almost since the time of their discovery by European explorers in the late fifteenth century. Mahogany developed a favorable reputation among early European and American shipbuilders and furniture makers for its durable, highly stable, and attractive wood. Big-leafed mahogany, one of the tallest trees in Neotropical America, has a discontinuous but wide distribution from southern Mexico to the Southwestern Amazonian Moist Forests of Peru, Bolivia, and Brazil, an ecoregion recognized by WWF-US for its biological wealth and conservation importance (Roozen 1998). The World Conservation Union (IUCN) considers the species vulnerable because of declining or unsuitable habitat and a level of exploitation that may be unsustainable. The species is exported from at least 14 Latin American countries and imported by 15 countries, primarily in North America and Europe. More than 120,000 cubic meters of big-leafed mahogany from Latin America enters international trade annually, of which 76,000 cubic meters, or 60 percent of global trade, is imported by the United States. In 1998, the equivalent of an estimated 57,000 big-leafed mahogany trees was harvested and shipped to the United States to supply a robust business in mahogany furniture (Lopez 1999). The United States consumes more timber per capita than any other country (Schwartzman and Kingston 1997). The United States is the largest importer of forest products, absorbing at least US$13 billion annually in logs, lumber, veneer, and other products made from softwood and, to a lesser extent, hardwood tree species (FAS 1999). Big-leafed mahogany constitutes a relatively small but lucrative portion of U.S. timber trade. While the species is only one of 200 tropical hardwood tree species available in the United States, it accounts for 57 percent of U.S. imports of tropical hardwood lumber by volume and 59 percent of these imports by value (Smith, Hass, and Luppold 1995). In 1998, the United States imported mahogany from eight Latin American countries, with 95 percent of all imports originating from Brazil (45 percent), Peru (32 percent), and Bolivia (18 percent). Approximately 60 U.S. companies in some 17 U.S. states are involved in the importation and distribution of big-leafed mahogany from Latin America, with the greatest amount imported by firms based in states east of the Mississippi River. In 1997 and 1998, North Carolina, the furniture manufacturing center of North America, accounted for most U.S. imports, absorbing 39 per cent of all U.S.-bound shipments. Mississippi is the second largest importing state at 24 percent, followed by Florida (11 percent), Pennsylvania (9 percent), and Louisiana (6 percent). The U.S. furniture industry absorbs about 90 percent of the top grade mahogany lumber imported into the United States, while lower grade mahogany goes into the production of doors and architectural millwork (Smith, Hass, and Luppold 1995). On the surface, supplies of mahogany would appear stable, keeping pace with U.S. demand. However, early signs of pressure on resource availability prompt questions about whether and when current levels of U.S. consumption of mahogany may exceed natural supply. The United States is one of the latest of several significant importers from colonial to modern times to con tribute to what essentially amounts to a practice and pattern of mahogany mining in neotropical forests. During their trade history, the American mahoganies, including Caribbean and more recently big-leafed mahogany, have experienced shifts in their availability as rates and levels of extraction in one country or region, combined with other factors like habitat loss, ultimately overtake or reduce tree regeneration (Siegel and Row 1965; Lamb 1966). Historical data show that as U.S. imports of mahogany decline from one country there is usually a corresponding increase in imports from another. From 1900 to 1960, for instance, the United States imported most of its mahogany from Belize and Mexico. By 1980, however, Bolivia and Brazil had supplanted Mesoamerican countries as leading U.S. mahogany suppliers. Lately, the list of South American countries supplying mahogany to the United States may be changing as their inventories decrease or access to the forests is restricted because of environmental concerns. For example, there has been a drop in U.S. imports from Bolivia, where restrictions are in place to reduce harvest (Worldwidewood 1999a). Conversely, Peru is paving the way to boost its mahogany production by selling to foreign companies timber concessions in the Biabo-Cordillera Azul region. Fluctuations in mahogany availability and accessibility are reflected best in trade data. From 1995 to 1998, U.S. imports from Bolivia decreased by two-thirds, while U.S. imports from Peru surged nearly fourfold. According to a TRAFFIC survey, several U.S. importers confirm that they have reacted to negative changes in their ability to obtain or maintain a supply of mahogany by importing from new source countries. Another sign of volatility is the high turnover rate in individual suppliers or exporters¡X12 of the 23 Bolivian companies that exported mahogany in 1996 did not export in 1999, suggesting an exporter attrition rate of more than 50 percent in four years (Bolivian CITES Authority 1999). Other indications of increasingly tight supplies are the escalating retail prices for mahogany, which are 25 percent higher today than a decade ago, and growing reliance on substitute species like African mahogany (Khaya spp.) and Philippine mahogany (Shorea spp.) (Woodshopnews). Possibly avoiding the financial costs and public pressure associated with big-leafed mahogany, U.S. companies boosted their imports of mahogany of African origin from 4,100 cubic meters in 1991 to more than 20,000 cubic meters in 1998, the highest levels since the mid-1970s. The phenomenon of replacing increasingly costly or scarce American mahogany with more competitive timber species raises valid questions about whether, and to what degree, potentially heavier harvest of substitute tree species will alter their biological status or role in the ecosystem. Concerns about excessive levels of legal harvest are intensified by illegal exploitation, which remains a serious problem in Central and South America, particularly in Bolivia, Brazil, and Peru. Illegal trade of big-leafed mahogany underscores the enforcement and management challenges with which government officials are faced in range states (Buitrón and Mulliken 1999; Dyer 2000; El Comercio 1999; ITTO 2000a; Kemper 2000). If history repeats itself, big-leafed mahogany, S. macrophylla, may have the same fate as its Caribbean cousin, S. mahagoni, which is no longer traded commercially as a result of intense over-harvest in the past. Commercial depletion of big-leafed mahogany could eliminate incentives for sustainably managing forests for high-value timber species. A concerted, long-lasting commitment by range states to mahogany conservation is central to preventing the demise of big-leafed mahogany and the displacement (or even disappearance) of local and international industries that depend on the resource. To their credit, Latin American countries have imposed logging moratoria, improved national legislation for mahogany, invested in forest certification, convened regional management workshops and, at the latest Convention on International Trade in Endangered Species of Wild Fauna and Flora (CITES) meeting in April 2000, reestablished a mahogany working group that will identify conservation priorities for the species. 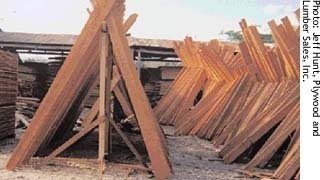 Despite these good-faith efforts, however, illegal and unmanaged exploitation of mahogany remains a problem throughout much of Central and South America. Range states¡¦ commitment to mahogany conservation would be aided enormously if consumer countries were to promote buyer awareness and alternatives and adopt policies that reinforce conservation initiatives in forests. After all, manufacturers and users of wood products in developed countries contribute to deleterious and dubious logging of mahogany by importing and using large volumes of the species¡¦ wood to satisfy a demand for fashionable furniture. Because consumer countries are partially responsible for mahogany¡¦s plight, they can and should participate in ways to minimize the effect of their consumption on the species. This responsibility especially belongs to the United States, which imports more mahogany than any other country. Whether passive or proactive, U.S. mahogany consumers have, along with producers and other end users, a shared economic interest in conserving this valuable resource. The following paragraphs outline various regulatory, policy, and voluntary interventions available to U.S. policy makers, companies, and consumers for improving mahogany conservation and complementing management efforts in range states. Consumers can support mahogany conservation by buying mahogany products that carry the Forest Stewardship Council (FSC) trademark, which certifies that the wood comes from forests that are managed in accordance with FSC's internationally endorsed principles and criteria. Companies using FSC¡¦s logo on wood products have demonstrated that the timber used in their products is harvested n an ecologically and socially responsible manner from well-managed forests. At present, only two U.S. companies are known to import big-leafed mahogany derived from forests certified by organizations accredited by FSC. However, the number of wholesalers, manufacturers, retailers, and municipalities purchasing, using, or pledging to buy FSC-certified wood s increasing in unison with concerns over forest health and management. Similarly, the number of neo-tropical forests certified for mahogany production remains small but is growing, with operations established in Guatemala, Honduras, and Mexico. Recent surveys and trends suggest certified wood products are gaining popularity in the United States, though more emphasis on promoting the benefits of certification among consumers is necessary for expansion of the market. Its high profile and a steady demand make mahogany a suitable species for publicizing the benefits of forest certification. The demand also makes low-impact forest management and logging economically feasible for many operations. • Individuals¡Xincluding homeowners, interior decorators, and architects¡Xwho are in the market for mahogany furniture should ask companies about the source of American mahogany used in furniture available in retail stores and catalogs. Where available, U.S. consumers should purchase furniture made with mahogany known to have come from well-managed forests of Central and South America. The best way to determine whether mahogany originated from responsibly managed forests is to look for the trademark of the Forest Stewardship Council (FSC), whose standards for managing forests are among the world¡¦s best. Consumers can visit the following Web sites for more information on the availability of FSC-certified mahogany: http://www.certifiedproducts.org/, http://www.ecotimber.com/, and http://pals4wood.com/. Consumers can also contact Certified Wood Source (HarryPage@compuserve.com). • U.S. importers, distributors, manufacturers, and retailers of mahogany lumber, paneling, furniture, and musical instruments can join the Certified Forest Products Council of North America¡Xa group of businesses and individuals committed to purchasing or giving preference to FSC-certified forest products. • Federal, state, and local governments can make a symbolic and substantive commitment to responsible forest management in Central and South America by agreeing to purchase or use mahogany from FSC-approved forests in public housing and construction projects. The more than 150 member countries of CITES can take unilateral action to protect native species within their borders from international trade by placing them on CITES Appendix III. Bolivia, Brazil, Costa Rica, and Mexico have listed their natural populations of big-leafed mahogany in Appendix III. This action has improved the regulation and record keeping on trade in mahogany exported from these countries. The discovery of a few procedural and permit discrepancies documented in this report, however, indicates that implementation of Appendix III in range states and the United States need additional attention and improvement. Range states that have yet to list their mahogany on Appendix III are urged to do so, because such an action would formalize under existing or new national legislation a government¡¦s commitment to regulate mahogany exports. Importing countries should continue to assist range states with implementation of the listing by producing training materials, monitoring shipments, and reporting permit irregularities. Species eligible for listing in Appendix II, the next level of CITES protection, must be proposed for such a listing and approved by member countries at the Conference of Parties that meets every two and a half years. Despite the monitoring value of Appendix III, its management benefits are questionable because, unlike CITES Appendix II, the use of scientific information is not required in decisions concerning export. Repeated attempts to list big-leafed mahogany in Appendix II have failed. In some respects, Appendix II would be much less restrictive and rigorous than measures like domestic logging moratoria already in place in some countries to protect mahogany. The criteria created by the Forest Stewardship Council (FSC) and applied to the certification of well-managed forests in Guatemala, Mexico, or Brazil, or those prepared by the International Tropical Timber Organization (ITTO) to assist countries with sustainable forestry management, may actually be compatible with and satisfy criteria that would be used under Appendix II to demonstrate that exports of mahogany are not detrimental to natural populations. Regardless, an Appendix II listing for mahogany would reassure overseas consumers that the mahogany used in their furniture was exported in a sustainable and legal manner. CITES regulates trade in mahogany saw logs, sawn wood, and veneer, exempting all other value-added products, including plywood and furniture, from its trade controls. It may become necessary to regulate under CITES a wider range of value-added mahogany products if the trend is toward a larger portion of trade in these products. At a minimum, monitoring of value-added mahogany products would close a gap in trade information and allow researchers to consider the scale and biological significance of these products in trade. Toward these ends, expanded use of the universal Harmonized System of Tariffs (HST) by creating a specific commodity code for big-leafed mahogany and its value-added products would enhance the conservation value of HST and complement CITES trade statistics. Moreover, closer compatibility between the reporting structures of HST and CITES might elucidate and explain data discrepancies. For instance, 1998 U.S. imports of big-leafed mahogany, as reported from CITES documents, were approximately 25,000 cubic meters lower than those compiled by the U.S. Department of Commerce, Bureau of the Census, using HST. Mahogany imported into the United States from Latin America in the form of minimally processed lumber is exempt from duties that may be imposed on imports of value-added commodities like plywood and furniture. Examples of duty-free mahogany commodities include sawn wood and veneer, which together account for the majority of U.S. mahogany imports. Several trade programs or regional agreements (not specific to mahogany) reduce or waive duties for mahogany products entering the United States from Latin America and the Caribbean. These include the Generalized System of Preferences (GSP) Program, Cartagena Agreement (ANDEAN Group), Caribbean Basin Economic Recovery Act (CBERA), and the North American Free Trade Agreement (NAFTA). Each of these is different but strives to improve the economies of developing countries in Latin America and the Caribbean. The U.S. government should consider increasing import tariffs on mahogany originating from Latin America under existing trade programs or agreements. Any increases could be balanced by lowering or waiving duties levied on products of non-threatened tree species. Monies generated from duties on imported mahogany products should be directed back to Central and South American countries for reinvestment in mahogany management efforts.